You play an important role in how well your children cope with all of the changes happening in their lives. While this is a stressful time for you as well, remember that your children look to you for guidance. Try to strike a balance between looking after your own needs and emotional health and supporting those of your children. Taking care of yourself – your physical and mental health – will go a long way in helping you cope. If you let yourself become worn out or overtired, you may have trouble making some of the many decisions that come up along the way. Get enough rest. Most adults need 7 to 8½ hours of sleep a night. Make exercise a daily habit. Walk or go for bicycle rides with your children. Eat healthy meals. If you were not the cook in the family home and now find yourself on your own, opt for healthier-choice items when eating out, or check out the ready-made salads or small portion meals available at your supermarket. If you have a job, continue to go to work. It restores a sense of normalcy and keeps you in contact with other adults. Use your support network. Don't be afraid to ask for help from friends, family, or even coworkers who are close to you. Spending time with your children is an excellent way to get your mind off of the separation or divorce. More importantly, it helps you reestablish bonds with your kids and it reassures them. Do activities that interest both you and the children, or alternate between parent's choice and kid's choice. Read books to younger children, go for bike rides or walks, play a board game or card game, have a picnic in the park, go to a movie – whatever you do together, try to make it fun and relaxing. 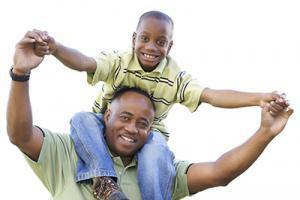 If you have more than one child, try to have some one-on-one time with each child on a regular basis. Take advantage of the opportunities as they arise (when one child is at a birthday party or visiting a friend, you and the other child can go to the park). Keep the children's rules/boundaries the same as they were before the separation or divorce. Now is not the time to make any changes. Kids need your guidance, and that includes firm rules or boundaries. All children benefit from a certain amount of structure. This helps them feel secure and know their place in the family. As much as possible, keep family life the same as it always was. Make sure the children keep up with their schoolwork and continue with their activities and interests. Children often feel powerless in a separation or divorce because most decisions are made by their parents. Give your children opportunities to make some choices in their daily lives. This way, they won't feel like things are totally out of their control. Don't overwhelm them by giving them too many options. For example, have a child choose between two pairs of pants when they are dressing for the day or between two activities, both acceptable to you. Some children, particularly preteens and teens, may try to take on some of the adult responsibilities in the absence of one parent in the household. While it is good for you to have help around the house, and beneficial for children to have regular chores, children must also have the chance to “just be a kid”. Encourage them to continue their activities and interests, including hanging out with their friends. Try not to let them become your emotional support. Rather, choose an adult who has a neutral, more mature perspective.